What a weekend. I was out of town and arrived back late last night. After I got settled, I found my See’s candy stash and popped two pieces in my mouth not even thinking that the chocolate would keep me up. So there I was laying in bed, wide awake and wishing I was asleep, and I started giggling to myself. 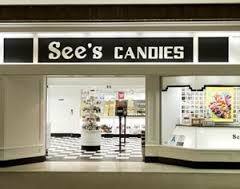 I was thinking about the See’s Candy I just ate when I was flooded by a not too distant memory. Now, you have to understand, I love See’s candy, like totally love it, and my kids are hooked on it too.They even know the motto, “The happy habit.” Sad, but true. It’s really not my fault. My mother and her mother- both See’s candy addicts. In 2013, I fell and broke my pelvis. I won’t go into the details now, but lets just say hellish is an understatement. I was in the hospital for four days. Once I transitioned back home, I slept in a hospital bed and used a walker. “These are so cool,” my babes shouted with glee, as they cranked the bed up and down. Me…not so much. I was completely miserable and to make matters worse, I couldn’t drive for two months. Being a single parent is hard enough, but this… this was a disaster. The day came that I was given the okay to drive. I picked up the kiddies from school and we made our first stop… you guessed it, See’s Candy. So, we pulled up to our regular spot and in we went. Once inside, I noticed there was only one other customer, an elderly woman with a walker. No joke. So, there we were. The two of us with our walkers and it hit me right then; I am in See’s Candy, a middle aged single woman with my walker… with my walker. Oh Lord, how in the world did I end up here? “Look mom, she has a walker, like you,” my youngest shouted. Yeah, that’s great. As I began to slowly make my way towards the counter, a gentleman entered the store. He froze midstride and just stared at me. Then he looked at her. Then back to me. Shaking his head, “Whoa. There is something really wrong with this picture.” At this point, Alex who had wandered over to the candies, returned to where I was. “Look what I can do,” she exclaimed, as she hoisted herself up in to the splits using my walker can as a gymnastics bar. This just can’t get any worse. We’re a freaking three-ring circus. What happened to you,” he asked. “Well, I broke my pelvis.” His eyes widened. “Well, I broke my hip last year,” the other lady chimed in. I stand corrected. Much worse. I will see your broken pelvis and raise you a broken hip. Not exactly how I envisioned my first day out. We chatted a bit more, then I continued making my way to the counter once I was able to get my gymnast to dismount. The other woman made her way to the door. As we slid our walkers past one another, I glanced over at her walker; “nice wheels.” I might as well embrace the situation. She smiled and nodded, and kept moving. Oh life, you are so unpredictable. I used to wonder, dear life, why there was no rhyme or rhythm to you, why I couldn’t anticipate what you would do next; how one day I could be a young married, stay-at-home mom and the next a single middle-aged women in the middle of See’s Candy with a walker. You see, I wanted to know what you would do so I could plan and prepare and feel safe. But that is not who you are.Your steadiness shows when the suns rises every morning, yet I am reminded that you are free to do as you please, bringing tragedy and sickness, a sudden loss of job, loss of spouse. And then I realized that when that safety and security come from within, come from my Lord, I am free to let you be you- whimsical and flowing- full of blessings, full of sorrow. Such a mystery. Such a joy. Oh, dear life, may you never cease to amaze me.